The original Mr. Potato Head toy consisted entirely of pieces! We used a real potato for the body! In 1952, George Lerner of New York City invented and patented Mr. Potato Head based on an earlier toy called “make a face” that used a real potato. Lerner originally designed his all-plastic toy as a prize for cereal promotions. It was manufactured and distributed by Hasbro. The Mr. Potato Head toy is the first toy ever advertised on network TV. Kids loved the many faces they could give their new toy however more than one Mother was puzzled as to why she came up one potato short for the family dinner. 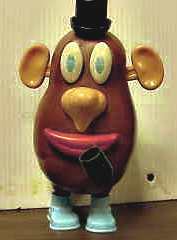 In 1964 due to children hanging on to their toys for extended periods, the whole ‘rotten potato’ thing caused Hasbro to include a plastic potato body with the toy, which certainly made our Mothers happy. He made his acting debut in the ‘Toy Story’ movies and also as a float in the Macy’s Thanksgiving Day Parade.